Yesterday was our church’s summer picnic. When you go to a large church with several services, you don’t often have the opportunity to connect with everyone. The summer picnic is an attempt to do this, have fun, and bless whoever happens along. Imagine going to the city park one afternoon in August and finding free burgers, bounce houses, snow cones, cotton candy, balloon animals, face painting, carnival games, etc. 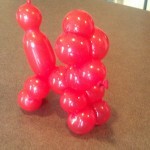 This is the third year we’ve made balloon animals and it is a treat for us. Except this year, when it was over, we had to turn some broken-hearted kids away. I think next year we’ll find a line Nazi to inform people “If you get in line now, you will not get a balloon,” rather than destroy a child’s afternoon. Standing dripping in the sun, hands itchy from latex, in front of a line that extends beyond sight–we’ve had the ability to study personalities of people when they receive free gifts. I’ve thought about this before, how some look a gift in the mouth and our tendency to take grace for granted. It is intriguing though, to see the ability of gratefulness or complaint can be taught by parents to their children. Which is fine, because we are twisting balloons for Jesus, but what happened next is the boy took the sword without a thank you, crinkled his nose and walked away. Like I said, we are doing it as a gift, but the happy faces make me love twisting balloons. Consistently, the parents who taught thankfulness walked away with happy children. Consistently…the parents who did not insist their children practice appreciation walked away unimpressed. I’m not a scientist, but think of something you are truly thankful for…now think of another…(do it for real, don’t just keep reading.) Did your day just get better? Nice, Hilarey – good reminder! Thank you I needed that today. It is hard to be thankful when your hurting all of the time. I feel better already. Love you.